Here at Total Foot Comfort we feel both a need and a responsibility to attempt to bring you as much information as possible on health conditions affecting the feet and legs. We want to be able to help you relieve your pain and stress and live a more comfortable and fulfilling life. That is why we not only attempt to bring you the highest quality insoles, socks, and shoe and foot care products, but also the information to deal with whatever condition you may be facing! Achilles tendonitis causes inflammation and degeneration of the Achilles tendon. The term arch pain (often referred to as arch strain) refers to an inflammation and/or burning sensation at the arch of the foot. Arthritis is a disease characterized by the inflammation of the cartilage and lining of the body’s joints. Athlete’s foot is a fungal infection that causes red, dry, flaking skin, sometimes accompanied by pain or itching. Bunions, referred to in the medical community as Hallux Valgus, are one of the most common forefoot problems. A bunion is a prominent bump on the inside of the foot around the big toe joint. A claw toe is a toe that is contracted at the PIP and DIP joints (middle and end joints in the toe), and can lead to severe pressure and pain. Corns like calluses develop from an accumulation of dead skin cells on the foot, forming thick, hardened areas. Diabetes is a serious disease that can develop from lack of insulin production in the body or due to the inability of the body's insulin to perform its normal everyday functions. A hammer toe is a toe that is contracted at the PIP joint (middle joint in the toe), potentially leading to severe pressure and pain. Heel fissures, also known as cracked heels can be a simple cosmetic problem and a nuisance, but can also lead to serious medical problems. Heel pain is a common condition in which weight bearing on the heel causes extreme discomfort. The heel bone is the largest bone in the foot and absorbs the most amount of shock and pressure. A heel spur develops as an abnormal growth of the heel bone. Known to physicians as onychocryptosis, ingrown toe nails are a common, painful condition that occur when skin on one or both sides of a nail grows over the edges of the nail, or when the nail itself grows into the skin. Many disorders can affect the joints in the toes, causing pain and preventing the foot from functioning as it should. A mallet toe occurs when the joint at the end of the toe cannot straighten. Metatarsalgia is a general term used to denote a painful foot condition in the metatarsal region of the foot (the area just before the toes, more commonly referred to as the ball-of-the-foot). Morton's Neuroma is a common foot problem associated with pain, swelling and/or an inflammation of a nerve, usually at the ball-of-the-foot between the 3rd and 4th toes. Morton's Toe is a common forefoot disorder where the second toe is longer than the Big Toe (the Hallux). Of the 16 million Americans with diabetes, 25% develop foot problems related to the disease. This is primarily due to a condition called neuropathy. People of all ages can experience forefoot problems. Overlapping toes can occur in any of the toes and can cause extreme irritation if not corrected. Over-pronation, or flat feet, is a common biomechanical problem that occurs in the walking process when a person's arch collapses upon weight bearing. 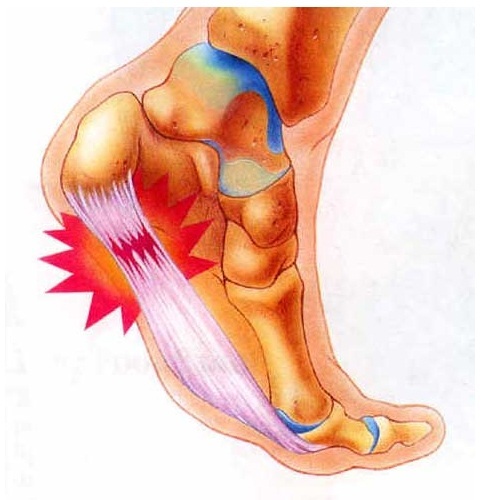 Plantar Fasciitis is an inflammation caused by excessive stretching of the plantar fascia. Pregnancy triggers many different changes in a woman's body. Many women have common complaints throughout their pregnancy. One of these complaints, often overlooked, is foot pain. Sesamoiditis is a common ailment that affects the forefoot, typically in young people who engage in physical activity like running or dancing. Shin splints are a common lower extremity complaint, especially among runners and other athletes. They are characterized by pain in the front or inside aspect of the lower leg due to overexertion of the muscles. Toenail fungus, known by physicians as Onychomycosis, affects about half of Americans by the age of 70. It is relatively rare in children, but the incidence increases with age.